deutscher Dichter (1797-1856). 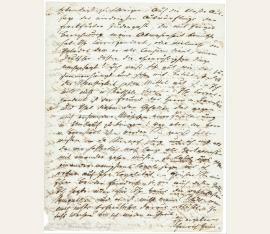 Autograph letter signed „Heinrich Heine“. Cauterets, Hautes Pyrenées. 4to. 2 SS. Kleine Randausrisse, Tinte leicht durchschlagend. 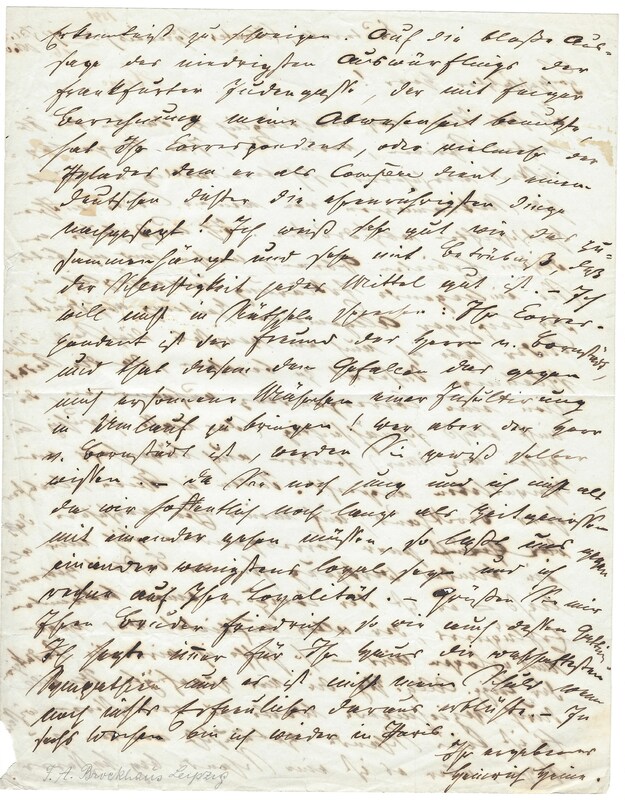 To the editor Heinrich Brockhaus in Leipzig, who had offered him to answer to a begrudging recension of his book “Über Ludwig Borne” in “Blätter für literarische Unterhaltung”. Heine instead asks him to answer to the infamous newspaper story that the banker Salomon Strauß, husband of Jeanette Strauß slapped him in the face on the street and that he then withdrew to the Pyrenees in shame. Dichter (1797-1856). 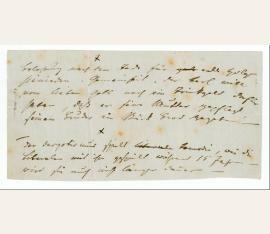 Autograph manuscript, poem in German and French, signed twice ("Heinrich Heine", "Henri Heiné"). Paris. 1 S. Tinte und Bleistift auf Velinpapier. Dreiseitiger Goldschnitt. Folio. Heine's short, self-ironic poem "Das Glück ist eine leichte Dirne", probably written between 1848 and 1851 and published in 1851 in his late collection "Romanzero": an unknown version, departing from the published text, penned as a dedication for Marie Buloz, who had visited the ailing poet on 19 March 1853 with her husband François, editor of the "Revue des Deux Mondes". Beside the German text (in ink) Heine has pencilled a French translation. A remarkable document from Heine's final years in what he called his "mattress tomb", during which writing, especially with pen and ink, cost him the greatest of efforts and he almost entirely limited himself to the use of the pencil. The album leaf was considered lost and was known to scholarship through an incomplete manuscript copy of the French translation only (by an unidentified scribe) in the Spoelberch de Loevenjoul collection, Musée de Chantilly, on which all critical editions base their text. 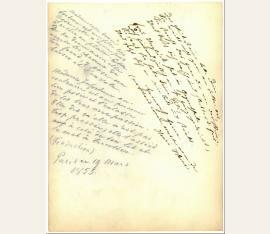 - Occasional slight smudging to pencil; a small trace of red ink near the German text..
Eigenh. Quittung mit U. („Henri Heine“). „Reçu de Monsieur Gouin la somme de cinq cents francs pour le compte de Mr. J. Meyerbeer [...]“. 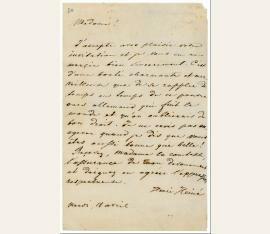 – From May to September 1848, Heine was living in a house located in rue de Passy (then Grande Rue de Passy). Meyerbeer had arrived in Paris on September 12, and lamented in a letter written to Amalia Beer in October that Heine had extorted from him 500 francs when he left Paris six months before, and on his arrival in September the same amount. – Some dust-soiling due to many years of framing. Eigenh. Brief mit U. ("Henri Heiné"). 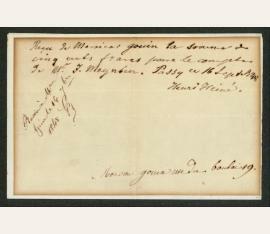 Letter to the Creole-born Maria Comtesse de Merlin de Jaruco (1789-1852), née Mercedes Santa Cruz y Montalvo, who ran a famous salon in Paris the 1840s: "I accept with much pleasure your invitation, for which I am most grateful. It is a marvelously kind and generous gesture to remember from time to time this poor German bear who shuns society and who would well deserve to be forgotten. I would not fear to exaggerate if I say you are as good as you are beautiful [...]" (transl. from the French original). - Subtle foxing, slight paper loss to upper right corner, and slight brushing to a single word, otherwise in fine condition. Two aphorisms, unpublished thus: "Belohnung nach dem Tode für [gestrichen: gute] edle Hdlgn. hienieden. Gemeinheit: der Kerl will vom lieben Gott noch ein Trinkgeld dafür haben, daß er seine Mutter gepflegt, seinem Bruder ein Stück Brod gegeben. / Der Despotismus spielt [gestrichen: liberale] Komödie, wie die Liberalen mit ihm gespielt während 15 Jahren - wird sie auch nicht länger dauern". - Slight foxing, with traces of folds. 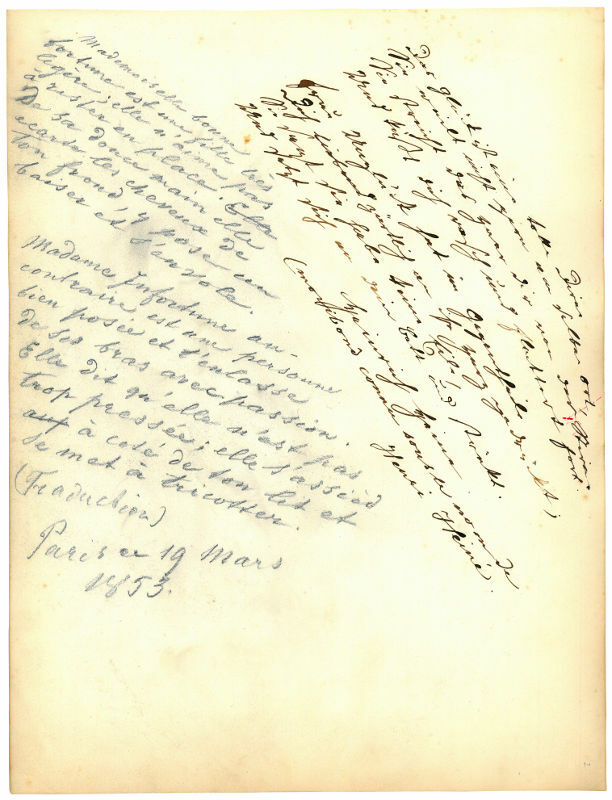 Traces of pins in left margin, corresponding with pinholes in the included certificate of authenticity by Heine's nephew Ludwig Baron Embden (1826-1904): "Die Handschrift meines Onkels Heinrich Heine, aus seinem Nachlaß einzelne Aphorismen".